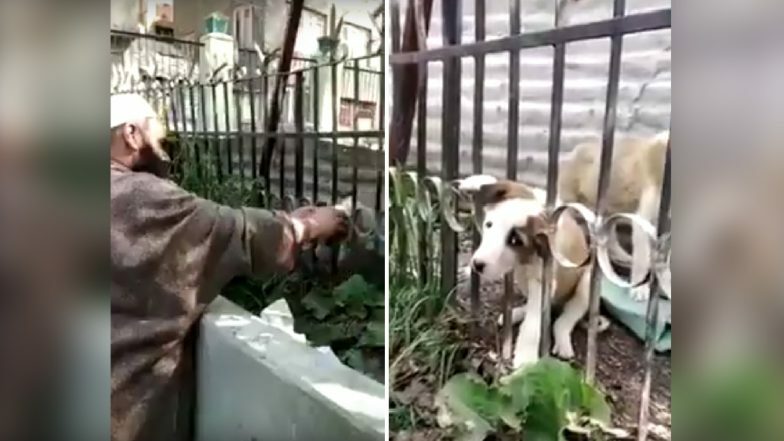 A video going viral on social media shows two Kashmiri residents saving a puppy that got stuck between iron bars of a gate. The little pup could be seen crying for help as the men try to rescue it. The innocent animal had got its head stuck accidentally inside the metal railing. It was trying to probably jump on the other side of the gate but got trapped. The men can be seen trying to take the pup out safely but the animal, visibly worried moves vigorously. The men then try to placate it, however, the puppy seems to get more worried. They even try to calm by patting its back, but by the pup looks restless. Finally, after multiple attempts, the men successfully manages to take its head out of the iron bars. The animal can be seen leaping away as soon as they rescue it. California Man Risks Life To Saves His Dog Trapped Inside Burning House; Dramatic Fire Rescue Video Goes Viral. One of the men was recording the incident as two of them tried to rescue it. While on one side there is an increase in incidents of animal cruelty, on the other side we have Good Samaritans like these. There have been multiple incidents in the past, when people selflessly tried to save animals. Last year, a tech innovator in Lucknow used a customised drone to rescue a puppy was drowning in a drain. We hope more people get inspired by incidents like these and spare a moment to help those in need. As the video went viral, the two men were praised for their good deed by social media users.